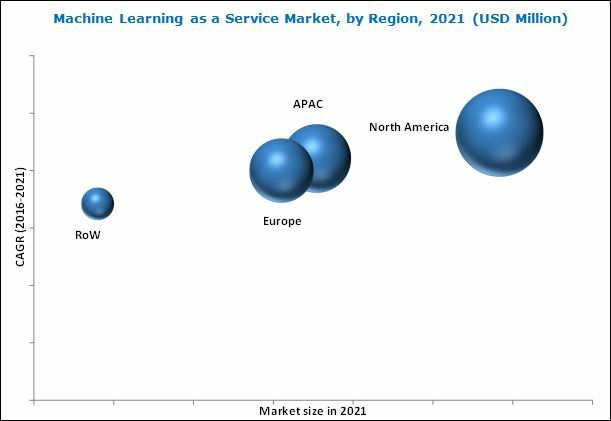 [137 Pages Report] The Machine Learning as a Service (MLaaS) market is estimated to grow from USD 613.4 million in 2016 to USD 3755.0 million by 2021, at a Compound Annual Growth Rate (CAGR) of 43.7% during the forecast period. The base year considered for the study is 2015 and the forecast period is from 2016 to 2021. Adoption of cloud based technologies, strong need to understand customer behavior, and advancements in technologies is expected to be driving the growth of the market in the coming years. Machine learning is a computing technology that offers computers the ability to learn and modify their analytical functionalities when exposed to new data sets, without being explicitly programmed. There are several factors that trigger the growth of the machine learning along with its associated advanced computing and analytics market. Some of them are rising demand for mapping customer behavior especially by the marketing and advertising sector, increasing concerns for security, and growing need for applications for support during emergency. Rapid advancements and innovations are happening in enabling technologies. Various solution providers are doing a lot of work in these areas. for instance, Affectiva recently launched its emotion analytics technology that has the largest data repository of over 2 million face videos, enabling its clients to achieve high accuracy with unmatchable insights. Apart from that, other players such as small players such as Cognitec System, Emotient, Gesturetek, Saffron, and Palantir are also making significant advancements in the field of gesture recognition, face recognition, cognitive computing, and neuron analytics. These developments are expected to fuel the growth of the market in coming years. The main objective of this report is to define, describe, and forecast the global MLaaS market on the basis of components which includes solutions/tools, services, and service models, along with application areas and regions. The report provides detailed information regarding the major factors influencing the growth of the market (drivers, restraints, opportunities, and industry-specific challenges). The report attempts to forecast the market size with respect to five main regions, namely, North America, Europe, Asia-Pacific (APAC), Latin America, and Middle East & Africa (MEA). The report strategically profiles key players and comprehensively analyzes their core competencies. This report also tracks and analyzes competitive developments such as joint ventures, Mergers and Acquisitions (M&A), new product developments, and Research & Development (R&D) activities in the MLaaS market. Others (data classification, recommendation engines, social media and customer analytics, sales lifecycle management). Which vertical holds the maximum opportunity of growth in the machine learning as a service market? Growth strategies undertaken by the key players and innovators in the machine learning as a service market? The Machine Learning as a Service (MLaaS) market size is expected to grow from USD 613.4 million in 2016 to USD 3755.0 million by 2021, at a Compound Annual Growth Rate (CAGR) of 43.7% during the forecast period. In the report, 2015 is considered the base year while the forecast period is 2016–2021. The major growth driver for the growth of the market are adoption of cloud-based technologies, strong need to understand customer behavior, and advancements in technologies. The MLaaS market is segmented by components (software tool and services), application, organization size, vertical, and region. Among the various software tools, cloud and web based API is expected to grow with the highest CAGR, as cloud and web based API can analyze data and add several application features related to machine learning algorithms, such as customer sentiment analysis, spam detection, recommendation systems, and many more. By application, network analytics and automated traffic management application is expected to grow at the highest rate during the forecast period. This growth is attributed because Machine learning is considered as a pivotal tool for network analytics and automated traffic management. This is owing to exceptional growth of data across verticals. Large amounts of data traverse network infrastructure on an everyday basis. With the advent of big data analytics, it has become possible to apply network-rich metrics to supply unmatched understanding into the IT infrastructure. By using general low overhead sensors in both hardware and software, an entire understanding of application and network performance can be achieved dynamically. By organization size SMBs segment is expected to grow at the highest CAGR in the MLaaS market during the forecast period. SMBs prefer MLaaS as the data provided by the machine learning application is dynamic. With the help of predictive analytics machine learning algorithms not only give real time data but also predict the future instances. SMBs can use machine learning solutions for the fine-tuning of their supply chain by predicting a product demand and providing suggestions on the timing and quantity of supplies required in order to meet customers’ expectations. North America is expected to contribute the largest market share and will continue to grow at the highest rate. North America has been the most forward towards adopting Machine Learning Services. Furthermore, this region has been extremely responsive towards adopting the latest technological advancements such as integration technologies with cloud, Big Data within Machine Learning Services. North America is foremost in deploying machine learning services into many applications and domains. Strong need to understand customer behavior drives the growth of the machine learning as a service market. In deep learning algorithms, data storage and archiving software plays a vital role in predicting the solutions for very complex problems. Since a deep learning algorithm deals with an artificial neural network composed of many layers, it needs a large amount of data sets to provide the result. Deep learning algorithm uses data storage and archiving software to target the complex functions in the artificial neural network. Over the last decade, machine learning technologies have evolved into “algorithms” formulated from diverse fields including statistics, mathematics, neuroscience, and computer science, making them commercially viable and computationally robust. Many applications available today such as speech recognition, fraud detection, and network optimization use a variety of machine learning techniques based on classification, regression, and estimation to process structured data sets. In machine learning algorithm, requirement of data is an essential input parameter. Some of the business verticals such as banking and financial services need a large amount of data instantly to predict the market behavior. Machine learning algorithms get very less time to predict solutions after gathering data from data storage and archiving software. To overcome this complexity, machine learning algorithms create an interface between cloud and the application platform. What are the upcoming industry applications for machine learning as a service? Lack of skilled consultants to deploy machine learning services is restraining the growth of machine learning as a service market. Integration of machine learning services can be done through both software and services depending on the level and nature of integration. In addition, enterprises need professional services to customize a particular capability to implement on their MLaaS platform. Several of the machine learning based offerings for predictive analytics are deployed to support an industry or a domain-specific usage scenario. Professional services of a data scientist or a developer are needed to customize an existing machine learning service, which caters to an industry. Major vendors in the market are Microsoft (Washington,US), Amazon Web Services (Washington, US), Hewlett Packard Enterprises (California, US), Google, Inc.(California, US), BigML Inc. (Oregon, US), FICO(California, US), IBM Corporation (New York, US), AT&T (Dallas, US), Fuzzy.ai (Montreal, Canada), Yottamine Analytics (Washington, US), Ersatz Labs (California, US), Sift-Science (California, US). These vendors have adopted different types of organic and inorganic growth strategies such as new product launches, partnerships & collaborations, and mergers & acquisitions to expand their offerings in the SDP market. 13.8 Hewlett-Packard Enterprise Development Lp.